I’m so excited to help you redesign your studio! Let’s create a clean, comfortable space with a place for all of your beautiful props, a desk you’ll look forward to going to work at in the morning, and an area where Arthur and Michael can come and hang out. 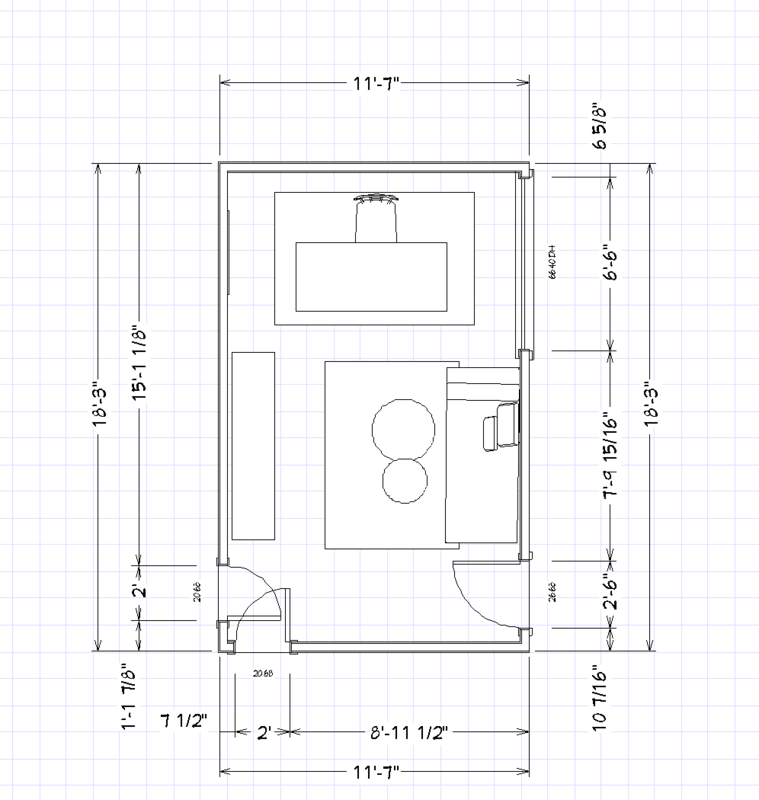 Needs: Place to work, storage for business paperwork, storage for props/remaining shop inventory, pull-out sofa for guests, a place for Arthur to hang out and visit. We’ll use this page as a way to document the process and we'll add to it as we go. 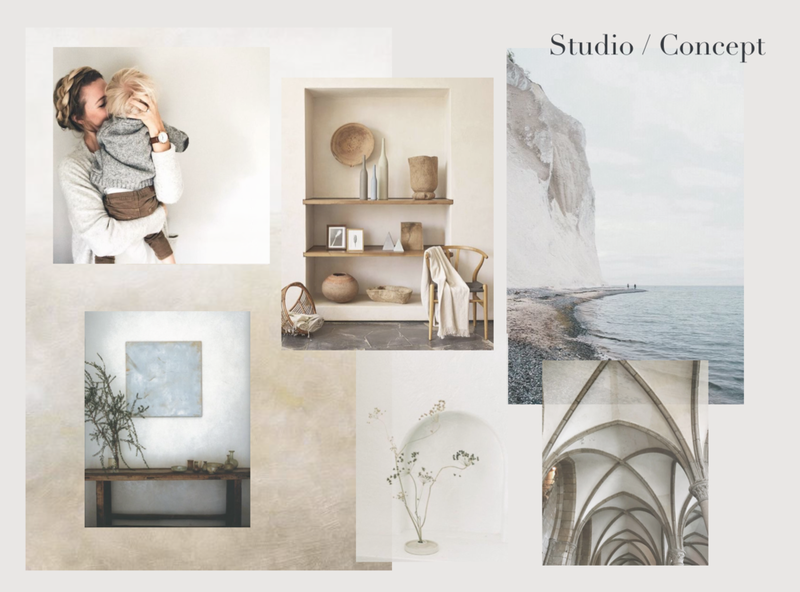 I'm envisioning your studio as a place full of shades of soft white, natural materials, and touches of calming blue tones. Like the cloisters you love, it will be a space for reading and reflection as well as a place for inspiration and new ideas. Let's keep things minimal — muted tones, gentle curves, textural elements — and old world with an artistic modernism. Below you'll see a preliminary plan for the space and a 3d model. I've just included the larger furniture items to start and then once I get your feedback, we can go back in and add more of the accessories. Let's pull your desk out into the center of the room so you still get that gorgeous light during the day and you can have a blank wall, or canvas, behind you that you can use for your live videos, workshops, or if you have a shoot you can pull the furniture away and stage it there. On the left wall, you'll have vertical space for all your ideas and inspiration boards, and on the right, under the window we can add storage or a bookshelf for paperwork, books, and office supplies you want to have close at hand. We'll leave the hutch essentially where it is now and use this space for your styling props and additional storage for your shop and office supplies. In this area, we'll also place the pull-out couch, a small coffee table, and two lightweight chairs that you can use for visiting in the lounge area or easily pull up to your desk for a conversation there. The coffee table will also be easily movable, in case you want to push things aside and use the floor space to work as well. We'll add two rugs to the space — one underneath your desk and one to designate the sitting area. Once you go through and clean, if there's enough room in one of the closets to store additional shop items and packing supplies, that would be amazing! If not, let me know and we can come up with an alternative plan. My goal is to source furniture and items for your office that are true to your aesthetic and that will photograph beautifully. I want you to be able to pick up anything from a throw blanket to a chair in your studio and be able to use it for a shoot, if needed. I know that we chatted about a budget of $4-5k and that you'd like to invest in a few key pieces that you really love. I included a range of price points for each item, so we can play with a few different configurations to find the perfect fit between the look and feel we're going for and the budget. I've sent you an invitation to this Pinterest board. Please browse through and leave comments directly on the pins to let me know what you love (or could do without). I want this to be a collaborative process, so if you come across something that you love, add it here and we'll work it into the design. I've broken the boards up into a few categories and then once we narrow in on some choices, I'll put together a final shopping list for you. - The Hutch: I think we could go one of two ways with the hutch: for a more polished look we could paint it and add wallpaper to the back wall for visual interest or we could leave it as is (or limewash it for a lighter look) and swap out the hardware to update it and keep it more rustic and natural, but with an updated look. - The Walls: I think if you and Michael are up for a paint project, giving the walls a fresh coat of paint will make a big difference in giving the space a fresh feel. I would recommend either Farrow & Ball in an estate emulsion, which has a beautiful chalky finish. Or a limewash paint for something that feels beautifully old world, just like one of your surfaces! Once we decide on a direction for the hutch, I'll pull together a couple options for you to test on the walls. - Sofa: I've sourced a couple of sleeper sofas here. I think that how much you decide to invest here will drive the direction on some of the other pieces in terms of budget. Take a look and let me know what styles you're excited about. - Vintage Pieces: I know you mentioned that you and Michael are going to Brimfield in July and that could be such a fun opportunity to get some unique pieces for your studio! We'll definitely want to layer in some vintage pieces throughout — vintage chairs for the sitting area could be really lovely and an affordable option and having vintage props displayed on the hutch will add a lot of character and patina. Hi Emma! This presentation contains more details for things like your hutch and accessories for your seating area. Let me know if you have any questions or would like to see something different!